Battelle Fellow Dr. Thom Dunning, currently co-director of the Northwest Institute for Advanced Computing, a collaborative research center between Pacific Northwest National Laboratory and the University of Washington, recently was elected as one of six new members to the International Academy of Quantum Molecular Science (IAQMS). The appointment was acknowledged as part of the IAQMS annual meeting held earlier this month in Beijing. Formal induction of the new members will be held next year in Menton, France, where IAQMS is headquartered. IAQMS membership is composed of scientists who have distinguished themselves through their scientific work, pioneering efforts, or leadership in the applications of quantum mechanics to the study of molecules and macromolecules. 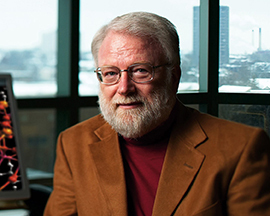 Dunning has had a long career developing computational techniques for quantum chemistry, as well as using theoretical and computational methods to advance understanding of molecular science. Prior to joining NIAC, Dunning served as Director of the National Center for Supercomputing Applications and Distinguished Chair for Research Excellence in Chemistry at the University of Illinois at Urbana-Champaign. During his initial tenure at PNNL (1989-2001), he was the Associate Director for Theory, Modeling and Simulation in the Environmental Molecular Sciences Laboratory, becoming the EMSL director in 1994 and the first Battelle Fellow in 1997. He now holds a Distinguished Faculty Fellow appointment in the University of Washington’s Department of Chemistry.